I seem to be one of the few people who isn't in love with this installment in the Gamache series, so I'll keep this brief. The anti-Christian views of the author come through constantly and clearly in this novel. 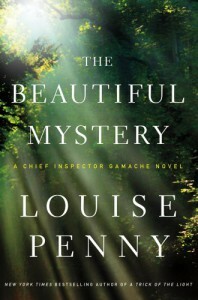 As the setting is a monastery rather than the storybook Three Pines, there are plenty of opportunities for Gamache and Beauvoir to wonder how seemingly intelligent grown men could dedicate themselves to God. Theories range from an inability to cope to society to the hypothesis that they are all child molesters hiding from the law. I could write an essay on this aspect of the book alone, but I won't. Jean Guy, normally my favorite character in this series, is acting like a child. He has left his spouse for no good reason, convinced his partner in adultery to do the same, and is willing to give up everything for one more Oxycontin. Everyone keeps referring to him as a 'young man' as if that's some kind of excuse for his behavior. He's 38. Besides these issues, the story in painfully slow building and just plain boring. It's time for me to take a little break from Gamache, but I'll be back.